On June 11, 2005, I took a walk. My daddy’s arm was intertwined with mine and, as we passed by the long rows of white chairs holding our lifelong family members and friends in the backyard of our country home, my white satin gown was dragging the ground behind me, and I thought that I must be the happiest girl in the world. Mr. Gore met me at the end of that early evening stroll, and he took my hand and he made me a promise. Ten years have passed since that beautiful day in June and, as the months were drawing nearer to the day of our anniversary, my husband and I began to discuss how we might celebrate. Our anniversary, bringing up the rear in a string of family birthdays, always seems to take the back burner, and the last time we actually appropriately celebrated our special day had been about five years and counting. We wanted to do things right this time. There were talks of returning to the seminary in Louisville, KY, where we spent our first years as man and wife. There were dreams — okay, maybe just on my part — of taking a road trip through Texas’s Hill Country during bluebonnet season. We even volleyed about the idea of traveling to Colorado with the kids, a state we’ve wanted to introduce them to for years. But none of the ideas we came up with, fabulous as they sounded, seemed to match up with the weightiness I was feeling in my heart concerning this important milestone we were about to celebrate. My heart was deeply stirred, drenched in sentimentality, and I couldn’t shake the persistent yearning to partake in an anniversary celebration that would satisfy all of the thoughts and emotions that were welling up within me concerning my husband, our life together, and the ten years we have traveled through as man and wife. Fast forward to last week, the week after our anniversary, when a friend at church asked me how I had come up with the idea for the celebration we ended up settling on. I was speechless for a minute, but finally, I responded with the only answer that seemed truthful. “I think it was actually the Holy Spirit,” I laughed. Marriage is under attack on a worldwide level. And I’m not talking about the political agenda of the democratic party, or the recent Supreme Court decision. I’m talking about within the Church. Every day, it seems, there is news of another divorce amongst professing believers, another scandalous affair, another set of vows crumbling under the weight of our culture’s wooing. It breaks my heart. And, believe me, it’s not as if I think I am better. I’m terrified, actually, and when I hear these stories, I am driven to my knees, not because I’m sad on a purely sympathetic level, but because I’m scared. That could be me, you know. That could be Mr. Gore. Because, if I’ve learned one thing in the last ten years about the union of marriage, it is that a lifelong agreement between two sinners is in most desperate need of a divine Helper. I didn’t understand marriage when I first got married, no, not at all. secretly, I knew we were going to “make it” in this business of marriage because we were in LOVE! Mr. Gore was my Prince Charming and I was his dream wife. We were PERFECT for each other! However, as the pixie dust fell slowly to the ground in the wake of years and babies and surgeries and budgets, my love underwent a steady transformation, morphing into something a little less fluffy and naive and more realistic and grounded. it has been a love no less beautiful. In fact, I truly believe the love I have for my husband today is even more beautiful than it was the day I became a bride, and I am sure that many wives of Christian husbands who are eager to love them in grace and truth, would agree. I love my husband now not simply because he makes my heart flitter around like a thousand butterflies, but because God helps me to love him. I die for him not just because he fills up my mind and my heart on a 24-hour a day basis, but because God enables me to lay down my life for his sake, even, incredibly, when I don’t want to. And would you believe that these sorts of binding matrimonial chains are incredibly freeing? In fact, I daresay they taketh my breath away! The world is an expert in downplaying the beauty of marital love. They make it look ugly and fat and boring and like something that is only worth celebrating on day one. The bridal industry is booming, while years and sometimes only months down the road, marriages are unraveling like the Berber carpet on our stairs. In other words, everyone wants to be a bride, but few people want to be a wife. Love that is easy and without blemish is sweet to look at. I’d be lying if I said the moony eyes of a young couple in love didn’t soften my heart and lead me to all kinds of goose-bumpy nostalgia. it is a city on a hill. Because that sort of love, while admittedly more gritty than the newlywed version, points back to a loving Savior who makes the broken whole, who can enable men and women to die to themselves daily, and who can cause the naturally faithless to cling to one another in an oath that causes them to soar. The glory of it all makes me desperate. 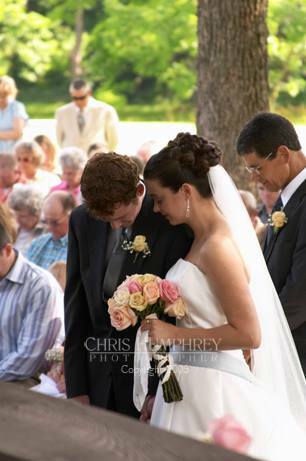 I want my kids to witness this truthful and biblical beauty of marriage, on a daily basis. The after-the-happily-ever-after. The romance of “true love”, but mixed with a little bit of life and proof. And do you know what? I want the Church and the world to see it, too. Thus, it soon became clear that I didn’t want to go to Texas or Colorado or Kentucky for our 10-year anniversary. I wanted to take a walk, and I wanted my kids to be there with me. I am beyond excited to share this anniversary series with you! Please stay tuned for Part Two, coming up tomorrow!